Is there a foolproof strategy for remembering irregular verbs? Absolutely. Just memorize them! Of course, that’s easier said than done. Do memory tricks actually work? Why not try to create a mnemonic for each of these common irregular verbs? You can also take the letters or beginning sounds of verbs to form an acrostic poem or an acronym. According to “Your Memory: How It Works and How to Improve It” by Kenneth L. Higbee, acronyms and acrostics work because they make the information more meaningful than words do alone, and they combine information together so that you have less to remember at once. Can you use an acrostic or acronym to memorize the past participles of the irregular verbs “to teach,” “to catch,” and “to fight?” Remember, you can use the beginning sounds, not just the beginning letters to form memorable words, phrases, or sounds. Did you notice a similarity between the past participles of teach, fight, and catch? Memorizing information in groups rather than single units is called chunking. You can find many charts of irregular verbs grouped together by their past participles or some other similar feature. The tables are great for reference, but if you really want to master the verbs you should investigate the patterns and create your own charts. Some people are visual or kinesthetic learners. In other words, they retain information from seeing and doing. If you learn well this way, create a physical or visual cue for the items you want to recall. 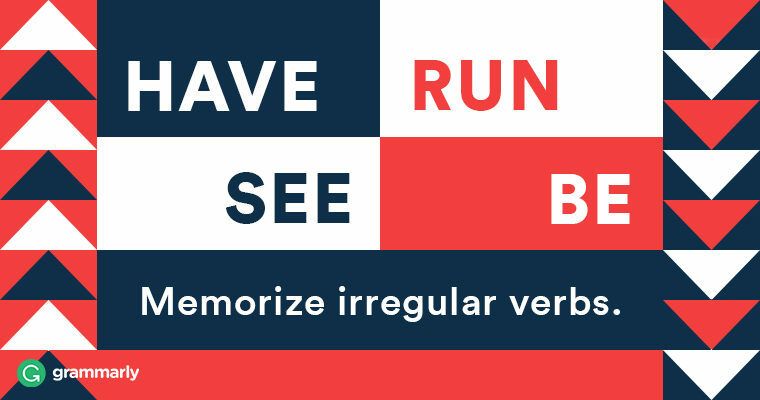 For verbs like “to see” and “to run,” it’s easy to make a drawing or perform an action that represents each verb. For other verbs, such as “to have,” a visual or physical cue might not be effective. In this case, the most tried-and-true method should be employed: practice, practice, practice… Thankfully, practicing doesn’t have to be boring. You can make flashcards, quiz a friend, or play an online game such as the MacMillan Dictionary Verb Wheel. Because “to have” is such a common verb in English, you will have plenty of opportunity to use it in conversation. How will you master irregular verbs? You can try setting them to a catchy tune or clapping out a rhythm. You can take the first sounds to create an acronym or an acrostic. You can create charts to organize the verbs in patterns that will help you to chunk the information together. Finally, you can create visual aids or physical actions to make a lasting impression. If all else fails, practice, practice, practice. You may have a lot of fun trying to figure out ways to memorize these essential irregulars. Which way will be most effective for you? There’s only one way to find out—give them all a try.